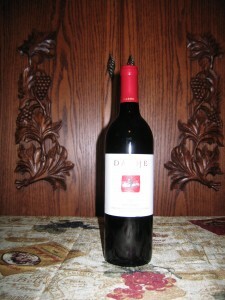 Cutting: An amazing big wine with strong blackberry, blueberry, raspberry, cocoa, tea and spice characteristics. The Dashe Cellars Todd Brothers Zinfandel from Alexander Valley is an amazing wine with strong fruit bomb aromas of blackberries, blueberries and raspberries along with cocoa, tea and spices. The same fantastic berry characteristics follow on the palate along with cocoa, tea and spice flavors and some licorice on the very long finish. Some tasters noted vanilla, oak and chocolate characteristics. All our tasters enjoyed this wine and our senior Zinfanatic ranked it number one in the Alexander Valley tasting.